This wildly wonderful bouncing creation will be sure to liven up any room! This Man on a Moon whimsical bouncer hangs from a long spring, bobbing up and down when gently tugged and will go for awhile. Sure to put a smile on everyone's face as they watch this guy in action! This wildly wonderful bouncing creation will be sure to liven up any room! 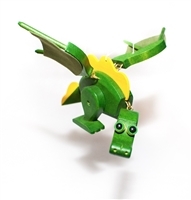 This Green Dragon whimsical bouncer hangs from a long spring, bobbing up and down when gently tugged and will bounce for a while. Sure to put a smile on everyone's face as they watch this guy in action! This wildly wonderful bouncing creation will be sure to liven up any room! This Birdie whimsical bouncer hangs from a long spring, bobbing up and down when gently tugged and will bounce for a while. Sure to put a smile on everyone's face as they watch this guy in action! This wildly wonderful bouncing creation will be sure to liven up any room! This Red Dragon whimsical bouncer hangs from a long spring, bobbing up and down when gently tugged and will bounce for awhile. Sure to put a smile on everyone's face as they watch this guy in action! This wildly wonderful bouncing creation will be sure to liven up any room! This Bicycle Guy whimsical bouncer hangs from a long spring, bobbing up and down when gently tugged and will bounce for a while. Sure to put a smile on everyone's face as they watch this guy in action! This wildly wonderful bouncing creation will be sure to liven up any room! This helicopter whimsical bouncer hangs from a long spring, bobbing up and down when gently tugged and will bounce for a while. Sure to put a smile on everyone's face as they watch this guy in action! This wildly wonderful bouncing creation will be sure to liven up any room! This Flying Man whimsical bouncer hangs from a long spring, bobbing up and down when gently tugged and will bounce for a while. Sure to put a smile on everyone's face as they watch this guy in action! This wildly wonderful bouncing creation will be sure to liven up any room! This Flying Bike whimsical bouncer hangs from a long spring, bobbing up and down when gently tugged and will bounce for a while. Sure to put a smile on everyone's face as they watch this guy in action! This wildly wonderful bouncing creation will be sure to liven up any room! This Dragon Plane whimsical bouncer hangs from a long spring, bobbing up and down when gently tugged and will bounce for a while. Sure to put a smile on everyone's face as they watch this guy in action! This wildly wonderful bouncing creation will be sure to liven up any room! 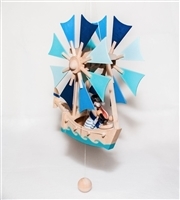 This Man in Boat Blue XL whimsical bouncer hangs from a long spring, bobbing up and down when gently tugged and will bounce for a while. Sure to put a smile on everyone's face as they watch this guy in action! This wildly wonderful bouncing creation will be sure to liven up any room! This Man in Boat Red XL whimsical bouncer hangs from a long spring, bobbing up and down when gently tugged and will bounce for awhile. Sure to put a smile on everyone's face as they watch this guy in action! This wildly wonderful bouncing creation will be sure to liven up any room! This Flying House whimsical bouncer hangs from a long spring, bobbing up and down when gently tugged and will bounce for a while. Sure to put a smile on everyone's face as they watch this guy in action!